Alas! The three judge appellate panel has denied the following petition, which was filed on 27 October 2010. The Court's order to deny the motion for reconsideration is not dated, but the response arrived in an envelope postmarked 17 November 2010 from zip code 10007. 2) The Plaintiff-Appellant-Petitioner is shocked and dismayed upon notification of the 13 October 2010 order to dismiss the appeal by Circuit Judges Robert David Sack, Barrington Daniels Parker, Jr. and Reena Raggi. He assures this Court that the issues presented in his brief filed on 24 September 2010 are neither frivolous nor malicious but are compelling and of great moment and in the interests of both justice and our national security. This brief is now published at www.show-the-house.com/id104.html with photos and links added. 4) The Plaintiff-Appellant-Petitioner is not asking for the moon, but a chance to confront the Defendants-Appellees with his evidence in a moment of truth. 5) Furthermore, the remedies sought by the Plaintiff-Appellant-Petitioner and reiterated in his 24 September 2010 brief are reasonable, forward looking, corrective, collaborative and in the best interests of justice, our national security and our nation’s proper standing as a sovereign equal among sovereign equals. 6) The Plaintiff-Appellant-Petitioner reminds this Court of its duty to prevent force and fraud and to act accordingly right here and right now. Otherwise, preventing a legal discovery process with respect to the purported 9/11 “Dulles Airport” video surveillance tape will only call into question the integrity of this Court and make it appear to be a mere instrument of a sovereign power infamously and globally defined by its full spectrum force and fraud. 7) The Plaintiff-Appellant-Petitioner also reminds this Court that one purpose of the Judiciary is to check the excesses of the executive and legislative branches of government and if in this case this is not done right here and right now such a constitutional crisis will expose our nation to adventitious outcomes. 8) The Plaintiff-Appellant-Petitioner advises this Court of the necessity to clarify for the public the difference between a ruse de guerre and a ruse à commencer une guerre. The Plaintiff-Appellant-Petitioner’s action provides the opportunity to do so. The Plaintiff-Appellant-Petitioner’s 24 September 2010 brief shows in partial measure an action program to take our nation to war without real justification. 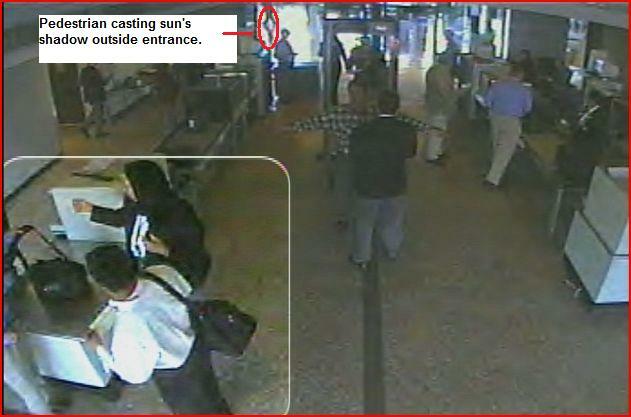 One component of this action program is the bogus 9/11 “Dulles Airport” video surveillance tape. This evidence is just the tip of the iceberg. 9) The wise advice seen on New York City subway posters to heighten security awareness - “If you see something, say something” - goes to the heart of the matter. Herein is the essence of what still promises to be a landmark case of a solitary citizen standing at the gates of justice and shaking the nations of the earth from extremely strong delusion about 9/11. But what kind of jurisprudence denies a watchman’s approach, let alone his warning? In a very real sense all citizens who see something and say something have proper standing and a corresponding natural right to a responsive government. Amendments IX and X of the Constitution of the United States guarantee that no law or statute or decision can deny the Plaintiff-Appellant-Petitioner’s right to a responsive government, let alone reasonable relief that leads in this case to exposure of treasonous, warmongering fraud and rewards his vigilance, loyalty and perseverance against all odds and under circumstances never before encountered or even imagined. 10) Let this Court affirm en banc that our government is a government of the people, by the people and for the people, and that no citizen with a good cause can be hermetically sealed from the process of justice under any circumstances. 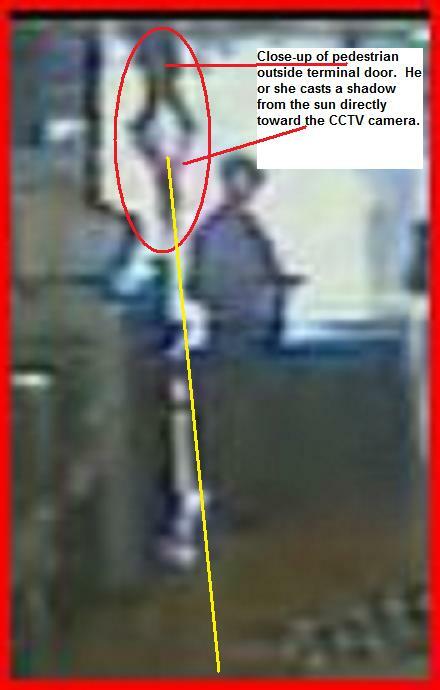 The photo above is a still taken from a video surveillance tape that was presented as evidence by the US Department of Justice at the trial of Zacharias Moussaoui in 2006. The US Government falsely said the video shows five Arabs arriving at Washington Dulles International Airport on the morning of 11 September 2001 shortly before they boarded American Airlines Flight 77 which they hijacked and crashed. 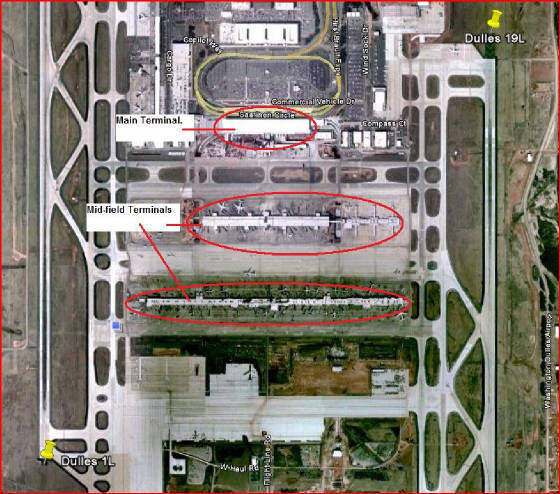 But as Google Earth’s satellite imagery shows below at right, the parallel main runways at Dulles go north/south at 10 and 190 degree headings and ground passengers come and go at the north face of the Main Terminal which is between the runways and directly adjacent to the access road. How, then, can one explain the sun’s shadow (a close-up appears below, left) cast by a passerby in the far background of the film? The shadow points toward the north face of the Main Terminal! This is impossible when the sun rises in the east and casts shadows westward as it did on the morning of 9/11. Therefore, the video is bogus in that it could not possibly have been made at Dulles, but was filmed elsewhere and then falsely presented to a jury as a Dulles video. See www.show-the-house.com/id92.html.